The arsenic reported earlier this week in Charlotte's major drinking water source poses no health hazards, Mecklenburg County's water-quality chief says. Rusty Rozzelle and Sam Perkins, the Catawba Riverkeeper Foundation's director of technical programs, talked to the community group We Love Mountain Island Lake at a Thursday night meeting. The meeting followed publication Monday of a Duke University study that found arsenic in the discharge water that flows into the lake from the Riverbend power plant, and in lake sediment. Arsenic is, of course, toxic. But Rozzelle told the group the arsenic is largely in sediment, not the lake water itself. "There is no potential threat to the water supply downstream of the discharge pipe," he said. "We've never found any arsenic above the minimum detection limits, and to my knowledge no one else has either." Charlotte-Mecklenburg Utilities tests Mountain Island water weekly with similar results, spokeswoman Karen Whichard said today. No arsenic is detected in treated water that flows to household taps, she said. The Riverkeeper Foundation worked with Duke University to collect water and sediment samples for study. Perkins said contaminated "pore water" in sediment can be released into the water column during certain conditions, such as summer heat, or if the sediment is disturbed. A more important question, Rozzelle said, is what will happen to Riverbend's ash ponds once Duke closes the c.-1929 plant by 2015. Rozzelle said Duke will have to submit a plan to permanently close the ponds, but hasn't yet. "To me, the important thing is how it's closed," he said. 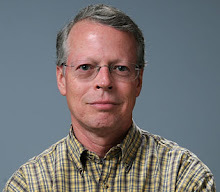 Bob Slocum, the voice of North Carolina's forest products industry for 24 years, died Tuesday in Raleigh at 62. Over his tenure, the N.C. Forestry Association grew to nearly 4,000 members, one of the largest such groups in the country. Slocum lobbied the N.C. legislature and served on commissions and task forces, defending his industry and private property rights -- and frequently irritating environmental advocates. I first encountered Bob in the early 1990s as controversy raged over chip mills and clear-cut logging in North Carolina's national forests. He was a forceful, knowledgeable advocate for his industry, but always a gentleman. At left, he's with Gov. 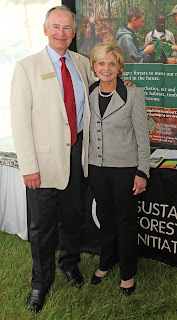 Perdue at last year's Forestry Day at the legislature. Among his top achievements the association lists is 2005's "Right to Practice Forestry" legislation, which limited local governments' control of forestry operations done under forest management plans or on property taxed as timberland. He also oversaw development of the association's ProLogger training program and forestry education programs for public schools. A career forester, he graduated from N.C. State University with a forestry management degree. He's survived by his wife, Linda, and three adult sons. Lake Norman Wildlife Conservationists and Carolina Raptor Center volunteer Anne Steinert are among this year's winners of the Governor's Conservation Achievement Awards. The annual awards are made by the N.C. Wildlife Federation. The Lake Norman group was named the federation's chapter of the year. The Mooresville-based group has certified the lake as "community wildlife habitat" with the National Wildlife Federation. Steinert, named wildlife volunteer of the year, has volunteered an average of 800 hours a year for the past 10 years at the Raptor Center, where she's a master-level rehabilitation volunteer. She assists in surgery, transports injured birds -- and bakes bread for the staff each Friday. Catawba County was named municipal conservationist of the year for its recycling and waste reduction program, which runs the county's EcoComplex and Resource Recovery Facility. Winston-Salem lawyer Michael Leonard won conservationist of the year for helping land trusts protect 266,750 acres across six states, including 120,000 acres in North Carolina. The N.C. League of Conservation Voters' annual scorecard awards an unprecedented 44 state legislators zeroes for their votes in the 2012 session. The League had previously handed out only four zeroes since 1999, and none since 2001. The league calls the 2011-12 legislative session one of the worst for the environment in state history. It charges that the Republican-led chambers, in an anti-regulation drive, made "reckless decisions" in approving hydraulic fracturing, banning policies on sea-level rise, removing key divisions from the environment department and limiting state oversight of toxic air pollutants. Twenty-nine legislators -- all Democrats -- voted the league's way, earning perfect scores. All the zero scores went to Republicans. Most interesting about the scorecard is how quickly and deeply divided the political parties have become on environmental issues. In the 2007-2008 session, the average difference between Democrats and Republicans was about 20 percent in both chambers. In 2011-12, that difference ballooned to 79 percent in the N.C. House and 61 percent in the Senate.